Taj Mahal is the iconic spot of Agra. Apart from sightseeing, Taj Mahal is famous for photography, night visit, museum strolling, relaxing, romantic outing and also shopping. However, there is no official souvenir or handicraft shop inside Taj Mahal. 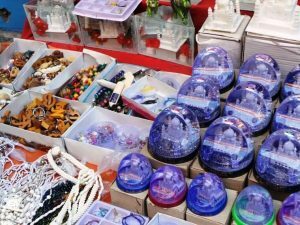 You can find numerous handicrafts stores right outside the monument. The area around Taj Mahal will be bursting with vendors. If you are visiting during tourism season, you are in for a treat.